A very important part of growing tomatoes is their need for vertical support. 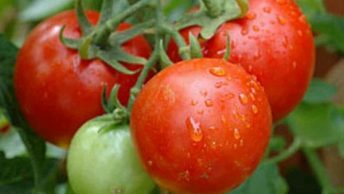 This particular need is taken care of by using cheap and easy DIY tomato cages to give the plant the vertical support it needs to grow properly. 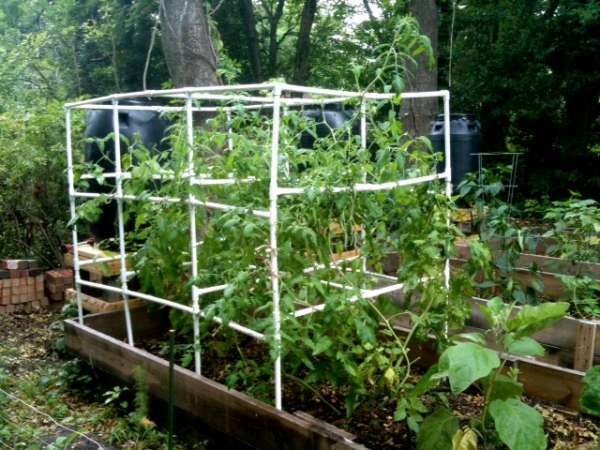 As almost all tomato farmers can attest to, you need good tomato cages for support and sometimes the store-bought tomato cage just isn’t able to provide that kind of support over a long time period. 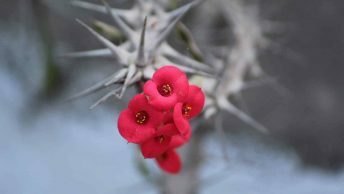 Most of them end up breaking after a year or two, usually when you are removing or adding them to your garden. The wires are pulled loose after a little while and due to its flimsy construction it can end up broken from when you are taking care of your tomatoes. It’s known that they are advertised as being reusable every time you plant tomatoes but the truth is that they can become damaged just from removing or inserting them into the ground. There also comes the problem of storage space. 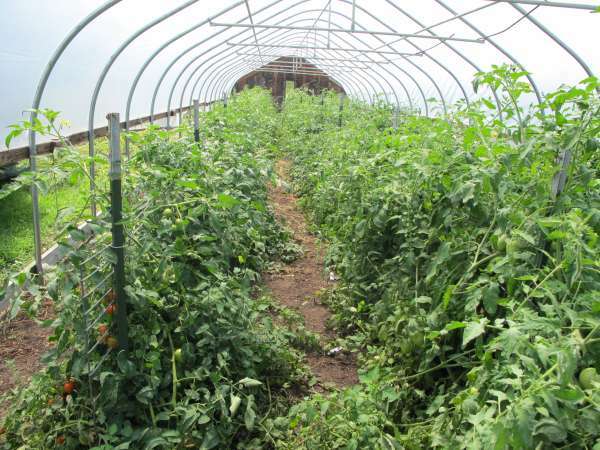 Due to the tomato cages large size and its inability to be flexible, storing the cages can be a real problem. 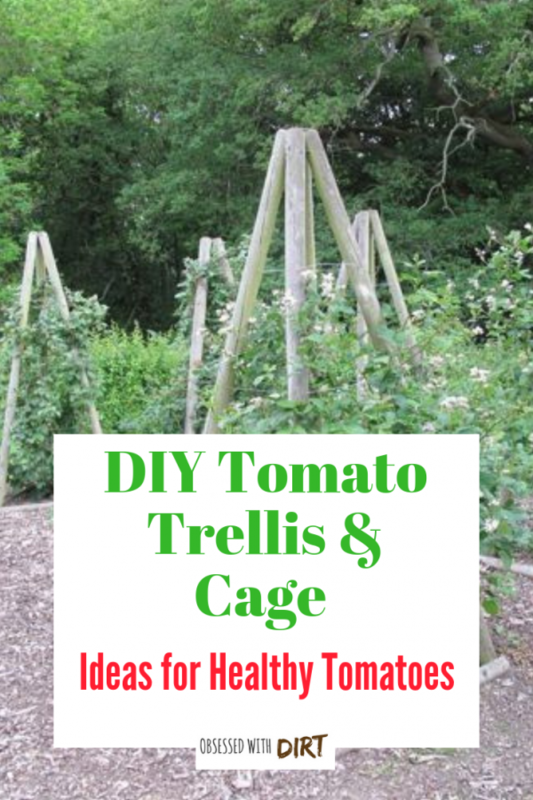 What most people don’t know is that building tomato cages by yourself is a relatively simple and inexpensive task. And by using a couple of different techniques it can also be made to look attractive for your garden. Despite being made to keep the cattle in a designated area, they are surprisingly good at providing plants with vertical support. Making this 16 x 4 feet metal fence is usable as a plant support system. It requires a little manual labor, and since this is a DIY project, I think manual labor is kind of mandatory. Oh, and don’t forget to bring your bolt cutters. First you need to make the width of the fence to just six squares wide. Cut the rest of the remaining squares along the length of the panel. Next you need to shorten the length of the panel to about 9 squares. For the last line of horizontal squares, you need to remove the horizontal wires so that your panel can go deep into the soil to support itself and stay upright. Repeat this same process for the remaining piece of the original panel. Using a straight piece of lumber that is at least as long as the panel, place it in the middle such that 3 squares are showing on the side of the lumber. Then pull on the end until the panel is at a 90 degree angle, it should look like a rectangle without two sides at this point. Do the same thing to the other remaining panel. Now before you go inserting the panel into the soil, you should take minute and straighten out the ends of the panels so that they all are even to each other, this provides a more stable support. Now insert both the panels around the plant in such a way that the plant is centered within the cage. You now have you very own tomato cage made by livestock panel and your own two hands. A very surprising thing you will notice at the end is how cheap this was and the best part is that it can be easily restored and reused next year since the panel does not rust. 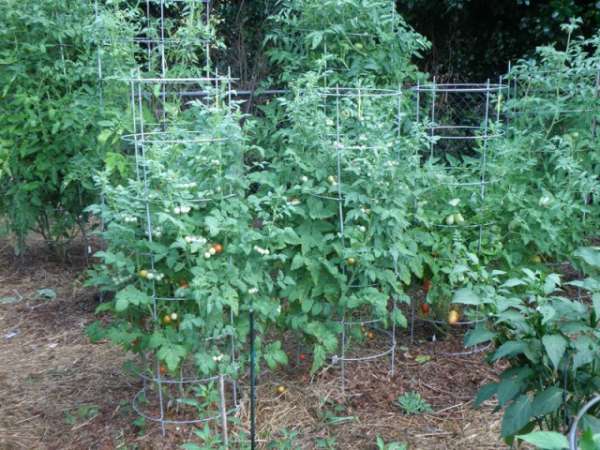 If you are looking for a durable, easy to assemble cage, check out Growsun 5 Ft Tomato Cage Plant Support Garden Stakes. Strong and will manage to stay up against very strong winds! This cage/stake hybrid is basically a steel wire panel that is held up by a stake, kind of obvious given the name. 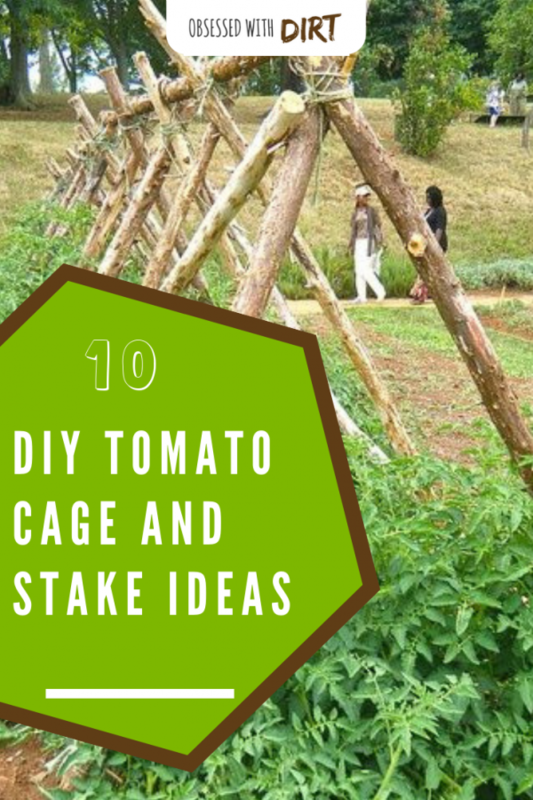 How you make a cage/stake hybrid or a Stake-A-Cage is that you plant a large wooden stake deep into the ground so that you have your basic yet strong support for the plant. Attach the wire panel to the stake using fencing nails. You can easily wound the tomato plant across the panel, and have a lot of free room to grow. 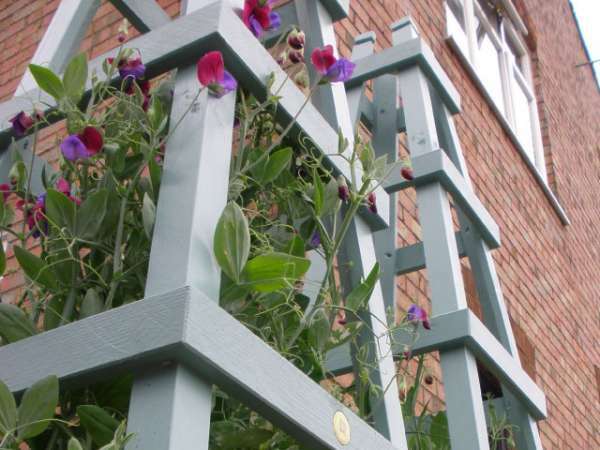 It combines the strong and durable support of the stake with the ease and benefits of a wire panel trellis. You can easily pick your harvest at the end of the season since the harvest is right in front of you, which is a surprising problem with using cages. You will need wire cutters, fencing nails, saw, hammer, 2x2x8 feet lumber stakes, and 30” high welded wire fence. Use the saw to make a pointed end on the lumber and then bury it 16” in the dirt. Next you use the wire cutters to cut the fence into 18×16 inches grid. Just hammer the fence into the wood using 3 fencing nails at the center, also known as U-nails. Note: Only use U-nails since they are perfect for this job and other nails usually end up being pulled out by the weight and lack of support. You now have your very own Stake-A-Cage and the best part is that all this costs is a little effort and approximately 2 dollars. Plus, these handy cages can last up to 5 years. If you need continuous support that is made of durable and excellent materials, check out F.O.T Sturdy Garden Plant Support Stakes 3-Sets Tomato Plant Cage. Highly recommended! Want to knowtips and ideas on different tomato varieties you can grow? 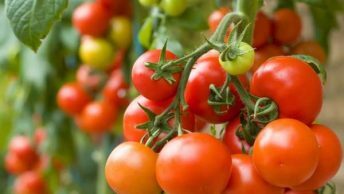 Check out our helpful blog 14 Best Tomato Varieties to Grow. As the name suggests, it is a tomato cage made entirely of wood. It is a very simple and easy to make project that only requires a little bit of effort. Since you only need some wood and nails the cost of making this cage is very low. What you need is two 2x2x8’ boards both cut in half, three 1x2x8’ boards cut in to different sizes. Cut the three 1x2x8’ boards in to six 1x2x18” and six 1x2x19.5”. The two 2x2x8’ boards that you cut in half at the beginning will be the four corners of your cage and the rest will be the support for the plants. Take the two of the corner boards and lay them out flat, starting from the absolute top hammer 3 of the remaining smaller boards, leaving at least 15” between each board. At this point you should have something resembling a ladder. Repeat this process with the other set of poles as well, now you have two ladders. Now you nail the remaining wood pieces to both of the sets of ‘ladders’ leaving 15” gaps between them, same as when you were making the first set. When you are done joining the boards of wood, you should notice that the last piece of side wood and the end of the poles have a larger gap between them then the gap between the other side pieces, this is fine, it is supposed to be this way. Now you plant the poles of the cage a few inches in to the dirt. 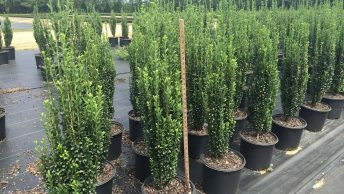 Since wood cages are more durable and have a heavier weight, you don’t need to plant them too deep. If you will go for minimal time needed to set up tomato trellis on new plants or already established plants without undue strain then EasyGO EGP-GARD-020 Stakes-Vegetable Trellis-3 Pack Tomato Plant Cages is for you. First, lay the columns on a flat surface at an angle. Cut the length of the rungs according to the space in between the two columns at different points. The space of the first rung will be the largest, and at least 6 inches from the bottom. The second rung will be a little shorter since it will go in the middle, and the shortest rung will be at the top. Remember to keep the angle same for the other columns as well and make 4 rungs for each step. Traditionally, the obelisk has 5 rungs but a little more or less according to your needs won’t hurt. A charming accent in the yard or on a terrace, deck or patio is Luster Leaf’s ready made Tomato Tower Obelisk. It will provide excellent support to your growing tomatoes. Check it out! Whoever invented this particular method is a genius. 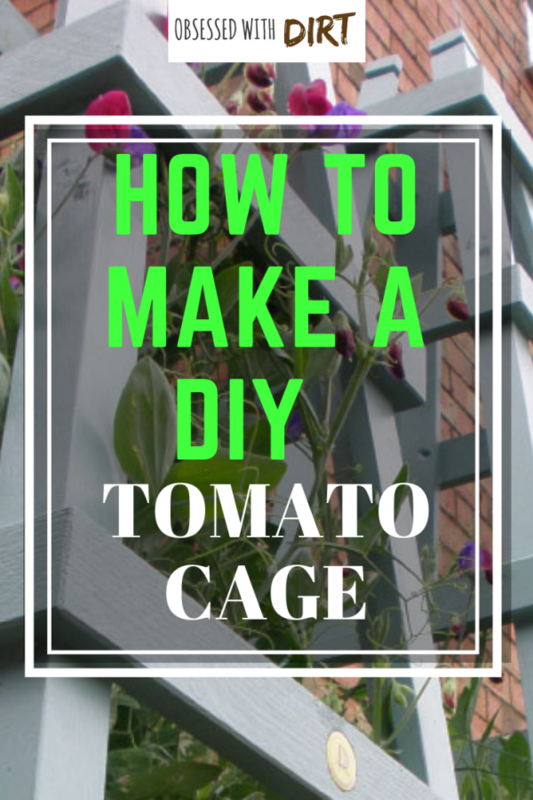 This particular cage makes use of the PVC’s extremely light weight and almost unbreakable body to give you the perfect tomato cage. With the PVC you can easily assemble and disassemble the cage as per your needs and since it won’t wither with time or break, you can use it for an indefinite amount of time. First you’re going to need 4 ½ inch T’s, 20 ½ inch elbows, 20 of the 10 inch straight PVC pipes, and finally 20 ½ inch crosses. First you want to attach two 10” pipes to a cross, on opposite sides to each other with one side facing up and one side in the dirt. Do this for 4 crosses and at the end of 4 of the 10” pipes, attach an elbow and then attach the remaining pipes on the other side of the elbow so that you have a square. The hole that faces up on each of the crosses should have a pipe in it. Now repeat the same process, only this time attach the crosses on the pipes that are facing up. Keep going until you reach your desired height for the cage. 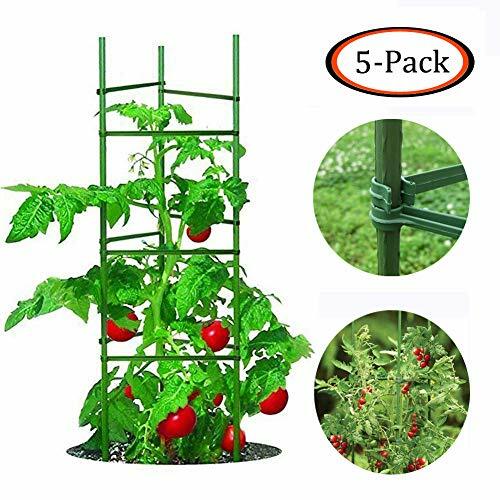 If you are looking for a long folding plant support for long term use, check out MTB Green Square Folding Tomato Cage Plant Support Tower. Very convenient at an affordable price! The concept of the folding tomato ladder is quite simple and as the name suggests, it is capable of being folded. First you attach two 1”x3” 8 feet long wooden strips at the top and do the same with two more of the same wooden strips. Now take a 2×4 inch piece of scarp board and attach the pair of wooden strips at the top using 3” deck screws. 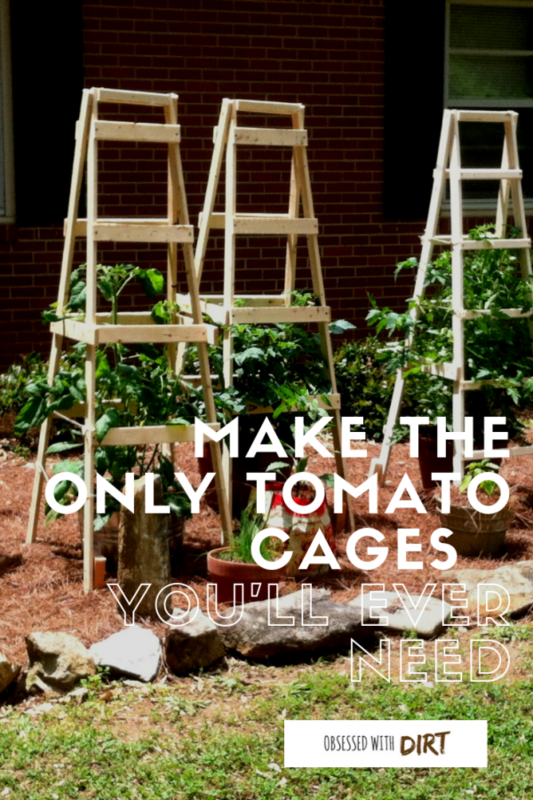 Now attach some rungs on the bottom of the ladder since they really aren’t needed at the top and voila, you have your very own, easy to make, folding tomato ladder. 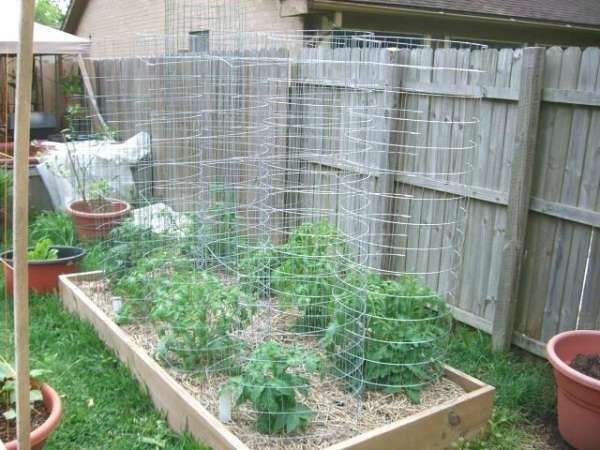 If you’re looking for taller tomato cages with stronger and old-fashioned cone-shaped supports, then Gardener’s Supply Company Square Heavy Gauge Extra Tall Tomato Cage is for you. Check it out! I think the design can be interpreted just by reading the name but I’ll just reiterate, yes, it is a teepee. Get 5 bamboo stakes and properly wedge it in to the ground at a slight angle. Make sure that bamboo sticks form a circular shape and wrap them at the top where they all intersect. Make sure to use a strong rope or twine and wrap it until it feels like nothing can break it. Plant a tomato plant at the bottom of each individual bamboo stick and as the plant grows make sure to wind the main stem around the stick. If you are looking for an economical shaped wire cages that are a great way to support small tomato plants, try these Panacea Products 89776 Heavy Duty Tomato and Plant Support Cage. Perfect for your tomato garden! They say that you shouldn’t judge a book by its cover but in this case you can ignore it. What you read in the name is pretty much what it is. 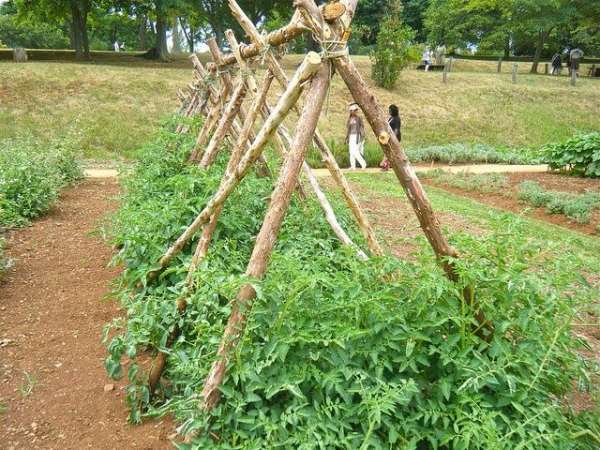 It is basically 4 support sticks placed in a square shape around the tomato plant and have walls of twine. This is literally the most easy-to-make and cheap cage that you can find out there and it won’t take more than 10 minutes to make. 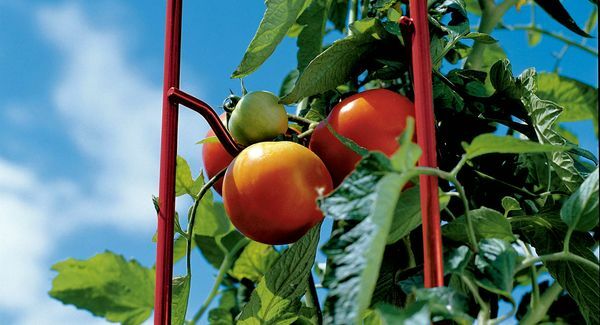 Another durable steel ring support with rust-resistant plastic coating is Plant Support Ring Garden Trellis by Anleo. Suitable for growing tomato plants at an affordable price! Wondering how to fix blossom end rot for your tomato garden? Check out our helpful blog on Blossom End Rot – What Is It and How to Fix It. It is like Tomato teepee with slight differences. The most major being that one cage will only cover one tomato plant. 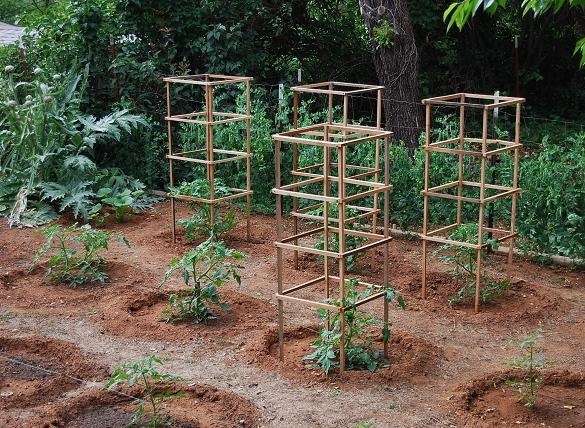 First, you plant the four 6 foot bamboos in the ground at an angle similar to the tomato teepee cage. Then you need to tie the bamboos with twine at where they intersect. Get two more bamboo sticks and mark the tree places in the teepee. This is where you will need to put “rungs of the ladder”. Measure the spaces in between the sticks at your desired points. Using a handsaw, cut the bamboo sticks in the length of the spaces. Make sure that you cut for all four sides. Attach the “rungs” using twine starting with the largest stick at the bottom and the smallest at the top. 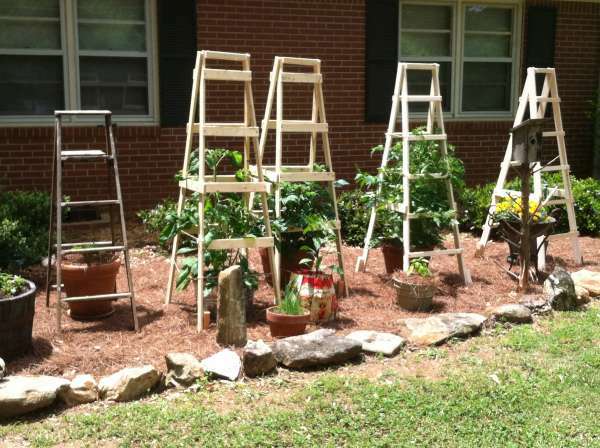 These steps will ensure that your tomato plant does not start sagging under its own weight. 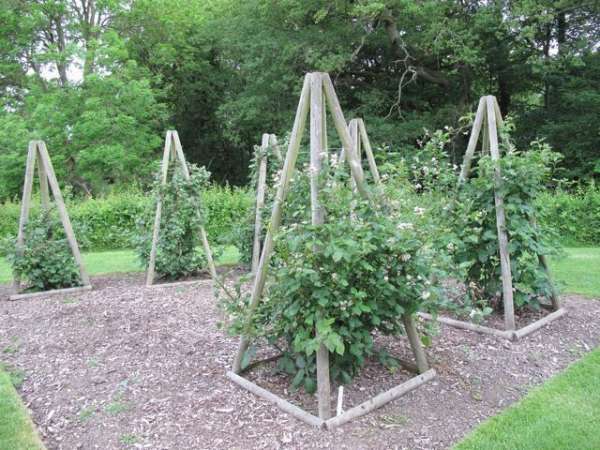 Lobesea’s Plant Support Ring Garden Trellis are designed to support and protect growing tomato plants by securing and straightening then from being damaged or breakage. Check it out! As the name says, this is a wire cage that will surround all your tomatoes like a giant cage. You will need two galvanized welded wire panels, wire cutters, 4 pieces of rebar and some twine. First you should cut of the bottom wire row so that the panels can go deeper and have more support. 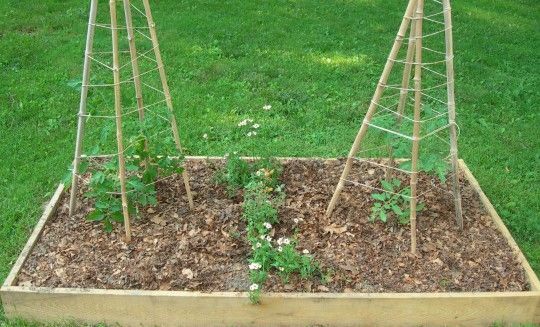 Plant the panels at an angle on each side of your tomatoes. Then drive the rebar into the soil outside of the panels. Finally, run the twine through the entire panels in a zig zag formation. They will be able to provide support to the growing plants. If you want to protect your tomato garden from unwanted animals, check out Erva Bunny Barricades. Excellent anchors to keep the cages secured to the soil and guaranteed protection too! 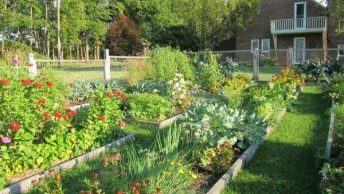 Do you want to be as creative as possible when it comes to your garden? 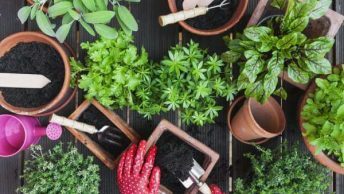 Check out our blog on Crafty Container Vegetable Gardening Design, Ideas and Tips.